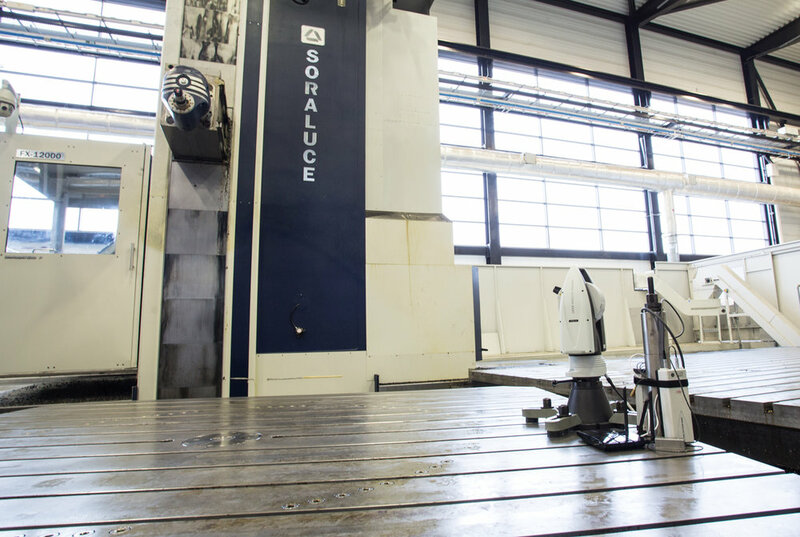 Modern manufacturing processes use large, complex machine tools with wide-ranging configurations. Today’s requirements on component production are increasingly challenging with tighter tolerances, higher rates and shorter cycle times. This requires higher tool utilisation at great speeds and feed-rates, increasingly vulnerability to wear, deformation and drift. To maintain machines and prevent scrap, regular checks must be undertaken. Verification operations on large machine tools typically require multiple days of downtime, so checks are scheduled infrequently, and slips in production can cause them to be cancelled altogether. A high-accuracy laser tracker is placed within the working volume of a machine tool and tracks a target held in the machine tool-holder. The machine is moved through a predetermined path to gather precise three-dimensional static and dynamic data throughout the working volume of the machine. A performance report is automatically generated by the BASELINE algorithm. BASELINE reduces machine tool verification downtime from several days to less than one hour. It can be used equally well on 3-axis machines or more complex configurations with multiple rotary axes. By overcoming the issue of lengthy downtimes, BASELINE allows verification checks to be conducted far more regularly. BASELINE is a new system, using technology that is at the heart of the drive towards industry 4.0. The BASELINE system set-up on the Soraluce FX12000 at the Nuclear AMRC, Rotherham. Want to find out more about BASELINE? If you would like to keep up-to-date with all the upcoming BASELINE news and are interested in further information about this new product system, fill in the form below and a member of the INSPHERE team will contact you directly. There is a long recognised need for consistent, effective, efficient and robust data to drive manufacturing processes and HYPERSCAN has been created to collect high-integrity datasets that are information-rich and can deliver the manufacturing insights that sit at the heart of Industry 4.0. It has the ability to provide diagnostic information and inform with respect to manufacturing trends, deformations and surface details. HYPERSCAN combines industrial automation with state-of-the-art metrology to provide a turnkey system for in-line measurement within a standard cell configuration. Robust data can be gathered even when challenged with measuring highly reflective or absorptive surfaces such as carbon fibre or machined aluminium and can be cost effectively scaled for parts up to 30 metres. Using robotics, sensor positioning is highly repeatable and follows the same paths each time which can be optimised specifically to a part. Furthermore, the system is capable of integrating multiple hardware, software and automation options allowing the most appropriate metrology for a feature type. This results in exceptionally repeatable measurements. HYPERSCAN delivers the robust, diagnostic manufacturing information that is a key enabler for smart factories. This can overcome the need for traditional CMMs which are difficult to install and also time consuming in use. Want to know more about HYPERSCAN? If you would like more information about how HYPERSCAN can help your business, register your interest in the form below and a member of the INSPHERE team will contact you directly.